I saw The Culture Show programme on the RA Summer Exhibition (you can see it here) and am very pleased to have found a willing friend to come with me to see it next week. 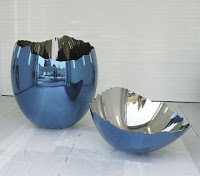 I’m fascinated by the large shiny blue egg – aka Jeff Koons’ “Cracked Egg (Blue)”, left, which won the Charles Wollaston award for the most distinguished work in the exhibition. Not sure I understand it but I like the colour…will report back when I’ve seen it in the flesh, so to speak. I’ve never been to the Summer Exhibition before so am strangely excited by it! !